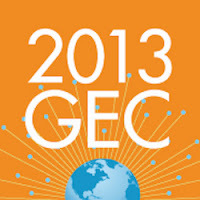 Today is day four of the 2013 Global Education Conference. Hard to believe we're almost at the end! During the conference opening sessions we brainstormed as set of grassroots global education projects that we could bring to our personal learning networks to try to get started. Given that our combined network reach is probably in the millions, the idea is to turn our personal learning networks into a large personal action network to make a difference for students right now. We voted on five project to to focus on right away with a set of basic questions for each: "What do you want to do? How will you accomplish this? What help do you need from the community?" The five projects are listed below, and each links to a project group on the conference site--please join one or more and then let us know how Lucy and I can help turn these into realities! Thanks to our GREAT volunteer group! We're always looking for volunteer session moderators--join us here. Today we again need help particularly with the early morning and then the evening sessions.